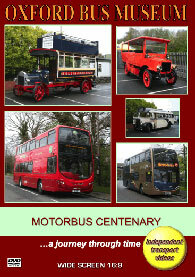 On Sunday 6th April 2014 the Oxford Bus Museum at Long Hanborough near Witney in Oxfordshire put on a grand show to celebrate 100 years of the motorbus. The independent transport videos cameras were in attendance to capture the event for you to enjoy. On this programme we feature seven vehicles, mainly associated with the Oxford area, which date from 1913 to 2013. Our ‘journey through time’ starts with the beautifully restored Leyland S3.30.T double decker, LF 9967 dating from 1913 belonging to Mike Sutcliffe. Our cameras take the seat beside the driver for a short run from the Museum, and then get the passenger experience on this superb vehicle. Our next ride is on the Museum’s Commer WP3, BM 2856 smartly turned out in the livery of Tappins Coaches. Also dating from 1913 we take a short ride to see what travel was like over one hundred years ago! We now move forward to 1949 when we take a ride though the lovely Oxfordshire countryside on board AEC Regal III, 703 (NJO 703) from the City of Oxford fleet. The luxury of the Willowbrook body certainly surpasses the experience from the previous thirty-six years! Moving forward just eleven years we board 1960 AEC Reliance 756 (756 AJO) for a run around the Oxfordshire lanes. Built as a one-man-operated service bus, the engine has now moved under the floor and the journey experience has taken yet another step forward. Having started our ‘journey through time’ on a double decker we now leap forward from 1913 to 1967 to ride on AEC Renown, 371 (FWL 371E) from the City of Oxford fleet and now owned by the Oxford Bus Museum. We take a circular trip around the small villages near to the Museum to enjoy the sights and sounds of this smart vehicle with a Northern Counties forward entrance body. Arriving back at the Museum we can now experience the buses from the 21st century! Our first example is a Volvo B5LH hybrid double decker with bodywork by Wrights. 368 (N1 OXF) entered service in the Oxford Buses fleet in 2013 and is operated on the city’s Park & Ride routes. We take a ride on this vehicle to experience the ride and sounds from this ‘diesel-electric’ bus, quite unlike the vehicles we have travelled on so far in this programme. Back at the Museum we change to an Alexander Dennis bodied Scania N230UD number 15934 (YN63 BYL) in the Stagecoach fleet. Smartly turned out in ‘Stagecoach Gold’ livery. This bus is the height of luxury for interurban travel. It has leather seats; under seat lighting offering passengers a smooth and quiet ride in today's world where bus operators have to compete with private cars, trains and even cheaper domestic air travel. With a ride on this superb bus you can now see for yourself how bus travel has moved on in the last one hundred years! Enjoy your journey!